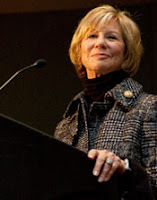 State Sen. Florence Shapiro (R-Plano) announced yesterday that she will not seek re-election to the Texas Senate. Shapiro, who has served in the senate since 1993, told the Texas Tribune that she is in final negotiations for a job with a Texas Based education company. Shapiro currently serves as chair of the Senate Education committee, a crucial bottleneck for any legislation dealing with anti-bullying efforts in Texas. Her support of both HB 1942 (the "super" anti-bullying bill) and HB 1386 (teen suicide prevention) during the 82nd regular legislative session last spring was crucial to both bills passing. Shapiro also voted in favor of legislation by Rep. Garnet Coleman (D-Houston) that made the Texas HIV Medication Advisory Committee statutorily permanent. Rep. Ken Paxton (R-McKinney) has announced he will run to replace Shapiro. Paxton has served in the House since 2003. Since legislation in Texas must pass both the House and Senate in order to become law his long career creates an opportunity to compare his voting record directly against Shapiro's. Like Shapiro, Paxton opposes marriage equality, but his opposition to LGBT equality extends further. In the 19 record votes on LGBT issues taken during Paxton's 8 year career he has consistently voted against the community on all but one vote. In 2007 Rep. Coleman attempted to amend the state budget to require schools receiving state funds to file reports documenting instances of harassment or discrimination on the basis of an enumerated list of characteristics that included sexual orientation and gender identity and expression. Paxton was out of the room at the time the vote was taken, but his opposition to even reporting that LGBT students were being bullied (let alone doing anything to stop it) was so strong that he entered a note in the official House record explaining that, had he been in the room, he would have voted against Coleman's amendment. Paxton's record reveals an elected official who will oppose any legislation that even hints at being good for LGBT people. While Shapiro is by no means a staunch ally of the community her potential replacement by Paxton would be disastrous for future attempts to achieve equality. Author and former Air Force Pilot Scott O'Grady has also announced plans to run for Shapiro's seat. O'Grady is new to electoral politics but has been courting Tea Party support since last year, speaking at various DFW area events. O'Grady's campaign has not made a public statement regarding his positions on LGBT issues.